Many homeowners view the kitchen as the center of the home, and they are willing to spend extra time and money selecting amenities and appliances that reflect their personal tastes, make them feel good, and support their lifestyle. But the elements of kitchen style go beyond cabinetry and flooring. Whether building new or taking on a remodel project, thoughtful design blends aesthetics, flow, and functionality while addressing the need for lighting, technology, and extra storage. Homeowners also are requesting upper-end appliances, drinking water filtration systems and adaptability for toddlers to aging seniors. These are among the findings of a recent American Institute of Architect’s Home Design Trends Survey, which focused on kitchen and bath design trends and found strong demand for residential design across the country. With the phasing out of incandescent light bulbs, architects and designers say LED lighting is pretty much standard in new construction and kitchen remodels. Architectural lighting is important for good kitchen design because it allows people to see what they are doing as well as highlight the cabinets, countertops and appliances that are important to them, says Dawn Zuber, AIA, chair of the AIA’s Custom Residential Architects Network (CRAN) and owner of Studio Z Architecture in Canton, Michigan. They use a lot less energy and produce a lot less heat. Plus, LEDs last longer and are great for spaces that are hard to reach, Zuber says. Installing a whole new LED fixture can be more involved if it’s something like recessed can lighting, because it may require drywall work, says Christopher Rose, and president of Christopher Rose Architects, PA, in Johns Island, South Carolina. Recessed retrofit kits are available, and clients have the option to go with LED bulbs or put in the fixture. Heat buildup has been a problem with LED bulbs in traditional fixtures. Those who have transitioned to integrated LED fixtures say they are much brighter. Virtually maintenance-free and cool to the touch, they consume up to 85 percent less energy than standard lighting. However, homeowners can’t just change a bulb when it goes bad with a LED fixture, but most manufacturers guarantee them for several years. Rose agrees that LED offerings have come a long way in terms of quality, color and selection. Technology has taken hold in the kitchen as families use smartphones, tablets and computers to pay bills, do homework or look up online recipes. Many homeowners are incorporating separate desk areas off the kitchen or a mud room to accommodate various technological gadgets, or requesting special drawers to keep them out of sight, says Jennifer Rusch, senior interior designer at Narofsky Architecture in Long Island City, New York. Many people have two phones and they want a place to stash their work phone where it can charge and they can be undisturbed at home, she says. People who love to cook and entertain are going big and high-end when it comes to appliances. Restaurant-type stoves, teppanyaki griddles, specialty ovens, espresso machines and everything in between, people want the top of the line and are planning kitchens around their appliances, Rusch says. Luxury brands include La Cornue, Viking, Gaggenau, Thermador, Miele, Sub-Zero and Wolf, but the price can be well over $30,000 for a whole kitchen with a La Cornue range topping $150,000. If that’s not quite in the budget, the next tier of Jenn-Air, KitchenAid, Electrolux, Bosch and Frigidaire offer features such as shallow depth refrigeration, convection ovens and noiseless dishwashers at package price points from $2,000 to $10,000, according to yaleappliance.com, which offers 20 different Buying Guides. Homeowners have gone from standard 30-inch stoves to cooktops that are 50- or 60-inches wide, Zuber says. Another popular option is dual fuel with a gas cooktop and electric convection oven. Other features include six burners with 22,000 BTU burners and an extra-low simmer, induction cooktops, griddle space, infrared broiler, steam oven, and warming drawer. Whether it’s to store food, keep clutter-free countertops or hide unsightly supplies, everyone wants a larger pantry, Zuber says. Many homeowners are requesting a separate room to house a second refrigerator or freezer and stow small appliances and other kitchen gadgets. “People just have a lot of stuff in their kitchens and they want a place to store it,” Zuber says. Innovations in pantry cabinets allow for better storage solutions when there isn’t room for a separate pantry, but the designers recommend it. Open shelving can help save on costs and hold odd-shaped appliances and bulk items. Corners are typically dead areas in a kitchen, so it’s an easy place to locate a walk-in pantry. As people become more health conscious and concerns mount over the safety of tap water, especially in regards to lead, homeowners are investing in home water filtration systems for drinking water, cooking and even bathing. Filtered water reduces unpleasant tastes, odors and discoloration and cuts down on harmful contaminants and chemicals. There are several types of systems and the cost widely varies, but many homeowners view a high-quality filtration system as an investment in their health. Some refrigerators have built-in filtration for drinking water and ice, or easy-to-install inline filters connect directly to a refrigerator’s water lines, but point-of-use or whole-house systems are more effective and some can eliminate the need for a water softener. Filters that attach to the faucet can be bulky and unattractive so most people opt for filters under their kitchen faucet or whole-house systems. Some are plumbed in so the filtered water is dispensed through a second, smaller faucet rather than the main kitchen faucet. They also have the option for hot filtered water for tea drinkers or cooking. Architects and designers have fewer requests for the last two design features: Double islands (25 percent) and adaptable or universal design (25 percent). 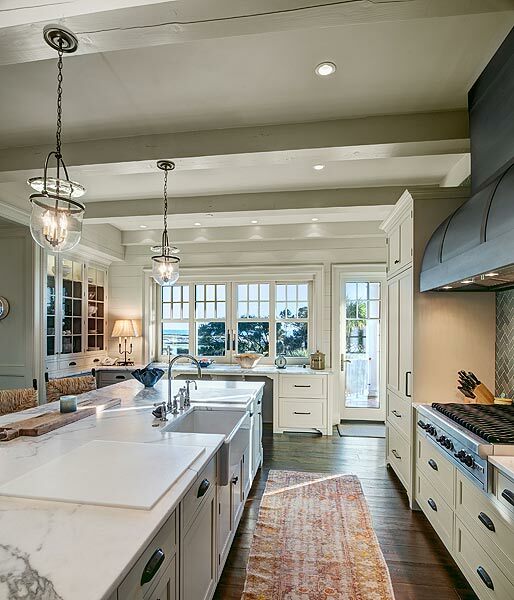 It can be challenging to try to fit two islands into a kitchen, unless one is more of a bar area with seating and the other is used as a prep area, Rose says. “There is kind of a diminishing return on kitchen size if you get too large as opposed to making it more efficient,” he says. Adaptability and universal design is thinking about ways to make the space more comfortable and user-friendly for children or people with physical limitations, whether that is space to maneuver a wheelchair, making appliances in reach for children or raising a dishwasher or installing a wall oven to avoid bending over, Zuber says. “People are starting to ask more for it as they think about aging in place,” Rose says.